A team of researchers studying the nearest star to our solar system, Proxima Centauri, has found possible evidence of a second planet in its system. Team members Fabio Del Sordo with the University of Crete and Mario Damasso with the Observatory of Turin gave a presentation of their findings at this year's Breakthrough Discuss conference held at the University of California, Berkeley campus. Proxima Centauri, a red dwarf, was first observed by Robert Innes back in 1915. It is located approximately 4.2 light years away, making it the closest star to our solar system. Three years ago, a team at the European Southern Observatory discovered a planet orbiting the star, which was promptly named Proxima Centauri b. 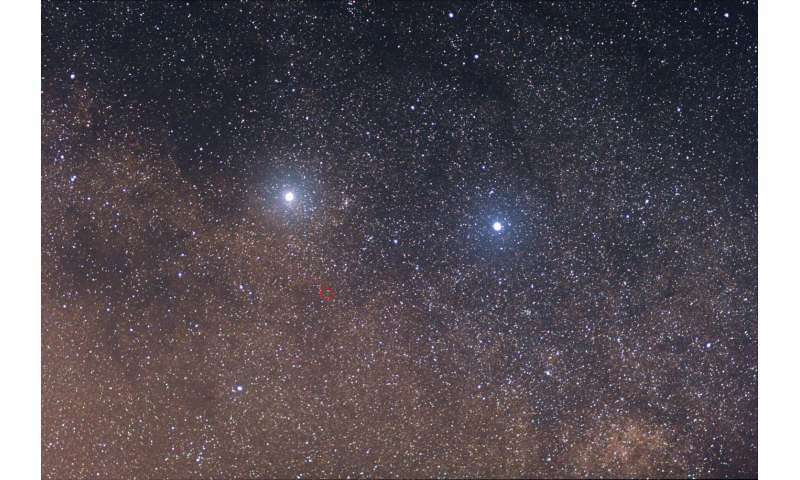 In this new effort, the researchers reported that they had found evidence suggesting that there might be another planet orbiting Proxima Centauri. Proxima Centauri b was identified by the slight wobbling of its host star. Del Sordo and Damasso reported that they have been studying data received by HARPS, a telescope at the European Southern Observatory in Chile. They further reported that data covering the past 17 years revealed similar signs of the star wobbling, suggesting another planet. The pair went on to suggest that if their findings pan out, they believe the exoplanet would have a mass approximately six times that of Earth, putting it in the category of a super-Earth planet—and would orbit approximately 1.5 AU from its star. It would also take the planet approximately five Earth years to make one orbit around its star. They note that such a long distance from a cooling star would likely mean very cold temperatures on the exoplanet—perhaps as cold as -234 degrees C.
The researchers also noted that they are confident that they have found a new exoplanet, but remain cautious. The team has written a paper outlining their observations, which has been submitted for publication but has not yet been peer reviewed. There is also the possibility that confirmation of the planet could come from the orbiting Gaia space-based observatory, which should be able to provide more evidence of an exoplanet if it is truly there.